To get to the activity building at Pleasant Playground in East Mount Airy, invisible from the street, you have to trust your instincts. You cut past the tennis courts and the pool, along the outfield fence of the baseball diamond, and now you've walked the distance of an entire city block. Finally, there is a grove of trees, some old playground equipment, the basketball courts, and here it is, the low-slung early-1950s building painted Philadelphia blue and maize. Like the majority of rec-center shelters built midcentury, this is a bare-bones structure, with an office, bathrooms, and a service room. It's from here that rec-center staff run their pickleball league, tennis, circus arts, and swimming. And like so many of these structures, it was hidden on the site, without any relationship to the street or the life of the neighborhood. That is all about to change. 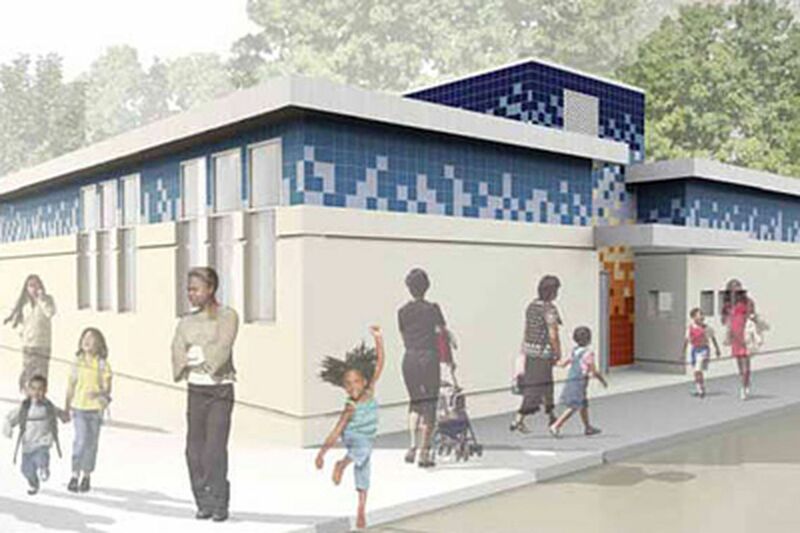 Construction will begin this year on a new, and much larger, rec-center building at the front of the site on busy Chew Avenue, one of three new recreation centers planned by the city by 2013. The result, says architect Joseph Powell of Buell Kratzer Powell Architects (BKP), the designer of Pleasant, is to "announce the rec center as a place of importance in the neighborhood." This shift in building location is indeed indicative of an ongoing shift in the city's approach to public buildings - from avoidance to engagement - that has the potential to significantly energize neighborhood life. "Inviting the public in instead of hiding makes a lot of sense," says Hilary Jay, founding director of Design Philadelphia. "And well-thought-out design can be used as a catalyst for change." All too often, however, public officials have looked at design as a superficial luxury instead of as a basis for planning. "As lovely as design is," says Eric Iffrig, who manages parks and recreation construction projects for the city's Department of Public Property, "the building has to be functional above all." This fairly conventional outlook belies some of the changes the department, under the management of Iffrig and deputy public property commissioner Gary Knappick, has been making. Last year they brought on three design professionals to manage parks and recreation construction projects. In fact, focusing on a recreation center's functionality presents a complicated design challenge. A rec building like Pleasant has to be durable, flexible, expandable, accessible, and easy to maintain. It must be a one-story masonry shell - a second story presents accessibility issues and requires additional staffing - that will service a diverse set of people and programs, from toddlers to seniors, from ceramics to circus arts. In other words, Pleasant's small 4,142-square-foot building has to perform by juggling all of these functions. Critically, a rec-center building's success is measured as much by how well it keeps people out as how well it invites people in. It has to be tall enough so people can't climb on the roof, and impossible to break into (or jack up and crawl inside). It must resist graffiti and other forms of vandalism, such as broken windows, and materials must be fireproof. That means limiting plastic playground equipment. Powell and his team at BKP seem to be motivated by the constraints. "For us, they serve as a catalyst to do something interesting. How do we make the box better? And how to make it better as efficiently as possible?" For the firm and the city's public property department, part of the answer is to find a building formula that can work in multiple locations. This isn't an unusual strategy. Chicago, for example, has developed a prototype library branch. The Pleasant building will thus draw closely from the firm's 2001 Holmesburg Rec Center, particularly in its use of structural glazed tile, which cleans easily and allows for the use of color and the creation of patterns. These aren't, however, dramatic or beautiful buildings. And because public agencies are rightly averse to financial risk, these projects aren't testing grounds for innovation, either. Says the city's Iffrig, "We have all the capacity to experiment, but it's the maintenance people who will have to pay if our experiments fail." Nevertheless, Powell, whose firm designed the elegant and inviting 2005 Widener Free Library branch on Lehigh Avenue in North Philadelphia, a building that embraces its urban location, has found ways to create thoughtful architecture at Pleasant. Like so many public buildings, this one finds its contemporary footing in sustainable design. Pleasant will have a vegetated roof and high-efficiency heating and air-conditioning. It also will be proportioned in a way that will make it feel more substantial than a one-story masonry shell. That's no small aspiration for a building whose primary users are children. It was Louis Kahn, mentor to Duncan Buell, BKP's retired partner, who declared the city "a place of availabilities . . . where a small boy, as he walks through it, may see something that will tell him what he wants to do his whole life." The question is, can Pleasant ultimately inspire? "It's all about the approach to the street," says Powell. "You elevate a building by integrating it into people's lives." You make it available. Philadelphia's neighborhood rec centers - some of them see four or five waves of activity a day - carry that extraordinary burden. Attention to design can only enhance the capacity to inspire, even with stingy public-sector budgets (there is only $10 million available this year for the renovation and construction of recreation centers). This is precisely what motivates Powell. "The public sector can raise the standard. It's a crime if they don't," he says. "Doing the right thing doesn't cost extra and a lot of that is hidden: how you site the building, the light coming in, what people see when they look through the window." These are all small items on a small building, but perhaps across the city they will add up. "Design," says Jay, "can create a destination." Nathaniel Popkin is coeditor of Hidden City Philadelphia, hiddencityphila.org. Contact him at nathaniel.popkin@gmail.com.